TOMS Women's Classic Canvas Slip Flats Shoes US Sizes Authentic Variety!!! Vionic Alda Tan Loafers Womens Size 6.5. These have markings on uppers...most notably under the chain detail. Shipped with USPS Priority Mail. Wonderful Sherry top spider Gold slip shoe. Great pre owned condition! Please note gold shade variation is part of the style. Condition is nice Pre-owned condition. 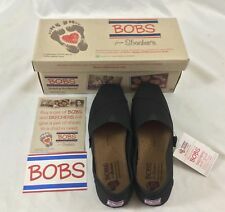 Gently used condition, Dr. Scholl's ladies slip on shoe in size 6M. Yellow pattern inners with blue jean color lining. These red leather and brown patent leather shoes, are made by COLE HAAN by NIKE AIR, and feature: grip soles, red leather uppers, with brown patent leather toes and back edge, a removable cushioned leather foot bed, and a narrow strap over the top of the foot. SAS Tripad Ladies Black Leather Flat Slip On Loafers Shoes Women’s Size 6 Narrow. Condition is Pre-owned. Shipped with USPS Priority Mail.